Orlando, Fla. — Set your alarm, it’s that time of year for the U Can Finish 5 Mile and 2 Mile presented by Florida Hospital. More than 3,000 community runners, walkers, UCF alumni and students are expected to invigorate the UCF campus Sunday, Oct. 16 for the U Can Finish races. The 2 Mile Run/Walk begins at 7:30 a.m. followed by the 5 Mile at 8:00 a.m. A free kid’s run for future Knights starts at 9:30 a.m. All events start/finish at the Bright House Networks Stadium. It’s an annual active-lifestyle event on campus and an opportunity for locals, UCF faculty, alumni and students to come together in support of healthy living and great causes. Participants have the extraordinary opportunity to run around campus and through sports venues such as Jay Bergman Field and Bright House Networks Stadium. Track Shack co-owner and Race Director, Jon Hughes says “by participating you’re not only benefiting the Track Shack Youth Foundation in support of youth health and fitness, you’re also benefiting programs of 4Ever Knights Student Alumni Association.” Through programs, benefits and services, 4EK provides the resources and opportunities for students to excel at UCF. 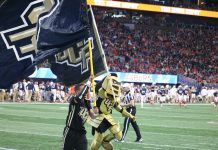 Campus student organizations should be pumped for the UCF Student Challenge! The largest team of runners/walkers (15 minimum) wins a $500 cash prize toward their organization. 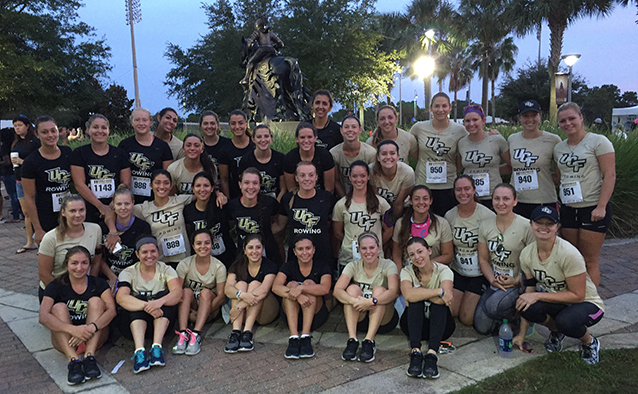 At the 2015 event, UCF Women’s Rowing had the largest group with over 33 runners/walkers. “We’re thrilled to recognize student organizations with so much enthusiasm for the race,” says Hughes. Registration required. Special student rate! $10 OFF the 5 Mile & Distance Dare Use Code: UCFKNIGHTS5DD. Finisher medals are awarded for the 5 Mile and Distance Dare events. Runner and walkers who conquer the 5 Mile and the 2 Mile distances for a total of 7 miles receive a stunning Sword and Shield medal! Participants can collect medals in the Shield Series. 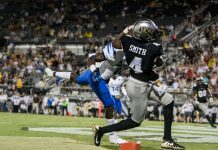 There’s award recognition for the fastest UCF student and alumni. To date, 362 UCF alumni and 65 students are registered.